B u y t h e t o y s , n o t t h e h y p e .
When the first series of Justice figures came out, we hadn't even heard of the book. But the story was actually quite good, despite basically being All-Star Superfriends. When Doctor Magnus fashions armor for the Justice League, making them impervious to the mind control worms, Batman helps lead the Knights of Justice into battle. Yes, that's Dr. Magnus, creator of the Metal Men. And the "mind control worms" were actually nanobots designed by Dr. Sivana, so you can probably guess where he got the idea. And though it may seem silly, the part where all the heroes put on their special hero-shaped armor? Crowning moment of awesome. There were two series of the Justice line that featured armored characters, but the coolest was easily Batman - hey, what did you expect? He's Batman. 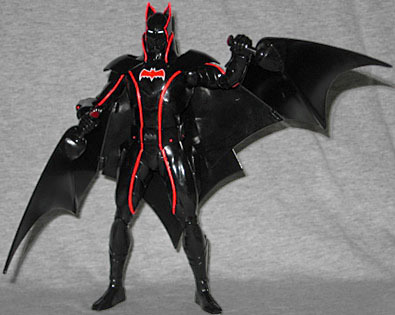 It's not that Bats' armor is a particularly cool design or anything - none of the heroes' new little suits were. It's just a black suit with a few typically "Alex Rossish" embellishments. Other than head, which has a vague analogue to Bruce's bat-ears in the form of a scalloped plate that runs around the back of the helmet, there's nothing particularly "Batman" about the design. Change the colors, and this could be anybody, right? Yes, that's very true, but the colors are what matter. At first glance, this just looks like a black outfit with some random red piping, and yes, that's an accurate (if dull) description of the way he looks. However, if you know your Bat-history, you'll probably feel that little tickle in your brain that tells you you've seen this somewhere before. And you have: it's an homage to the Adam West Batmobile! Seriously, compare them: glossy black body, red detailing, a distinctive combination of curves and points... even the white-outlined red batsymbol is the same. Suddenly a mediocre design becomes just a bit brilliant. 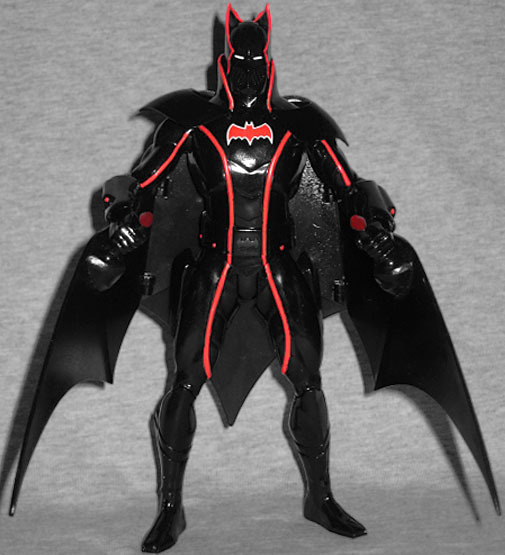 Armored Batman stands more than 7½" tall, which is typical for the oversized Alex Ross figures. His articulation is similarly standard, with nothing just the sad swivel neck, balljointed shoulders, hinge elbows, swivel wrists, swivel hips and hinged knees. At least this time there's an excuse for the lack of a waist - the big square pockets on his utility belt and the stripes running down his body would have gotten messed up. The panels on his shoulders are hinged, so they move with the arms. And why would you want to move the arms that way? Bruce's only accessory, other than the Justice-standard display base, is a tremendous jetpack or something. It has wings, of course, to make it resemble a bat, and the three exhaust pipes on the back are another nod to the Batmobile. 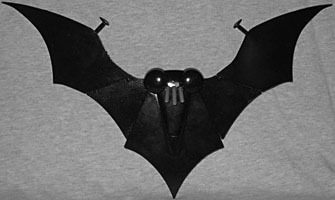 There are hinges in each wing, and a swivel where the wing joins the body. Each wing has a control stick mounted on a balljoint, as well, allowing Batman to steer (the tops of the handles pull out so you can get them into his hands). The entire rig mounts on the figure's back via a non-removable peg, and the various joints allow the arms to retain nearly a full range of motion even when he's gripping the controls. That's nice work, right there. The figure is already limited enough, no need to ruin it further. This version of Batman is a clever design, if you like the old Batmobile, but you really have to be careful when buying one. Nine times out of 10, the paint is disappointingly sloppy. When all you have is gloss black with bright red lines, they need to be dead-on sharp without even a tiny error, and that just doesn't happen. I looked at figures in at least six stores before finding one that was acceptable, and even this one still has some problems. 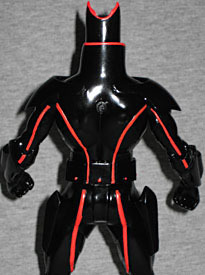 Bad paint was endemic on this figure, which is truly a shame. We love the idea behind Batman's armor, but the production is just too unreliable to allow us to recommend it. Discuss this (and everything else) on our message board, the Loafing Lounge! © 2001 - present, OAFE. All rights reserved.